Save on Skateboarding at Basket Express. Top brands include Aluminati Skateboards. & Aluminati Skateboards. Hurry! Limited time offers. Offers valid only while supplies last. 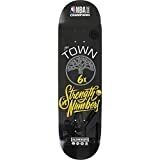 Aluminati Skateboards NBA 2018 Champion Warrior 6x Woody Limited Edition - 8.25" x 32"